I hate that King with the big head. He’s the scariest and most unappetizing mascot I’ve ever seen for a product, especially one that made my eyes spin when I first chomped down on a Whopper in 1967 and my life as a junk food junkie evolved to a higher plane than my permanently sugar infused cells could have ever imagined. But every time since his/its birth that I’ve seen that massive plastic headed thing appear in a Burger King commercial I’ve vowed to never again let my choppers sink into the flame broiled meat festival I so love. 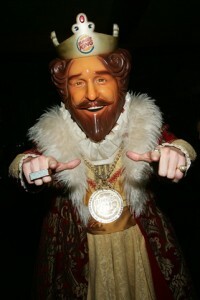 But now the King has taken meat to a new high and I just may have to bow and become a loyal subject once again. At 4 bucks a pop all the men you love can now smell like a sizzling burger. 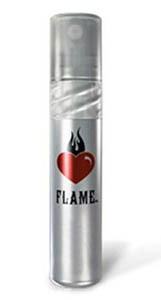 Behold the scent of seduction with FLAME body spray for men by BK. No lie! I just ordered a case as this precious commodity of American ingenuity surely deserves an entire shelf in my beloved Soul Kitsch collection. Though I’m sure I will part with a few bottles so the epidermis of those males I cherish most makes the air around us all even more fragrant. I haven’t seen any photos that show the BK logo proudly gracing the newest item on the menu, but I certainly hope it’s pressed into the metal as proudly as a pickle chip sits atop its progenitor Whopper meat heap. Just as the American people have elected their first African American president, one who seems so wise, beneficent and level headed, I can only believe it’s the same strong faith, chutzpah and ingenuity in its inventors that led to a product so distinctly American as FLAME.